Your unborn baby has been diagnosed with Hypoplastic Left Heart Syndrome. What does this mean for your baby and your family? Q. 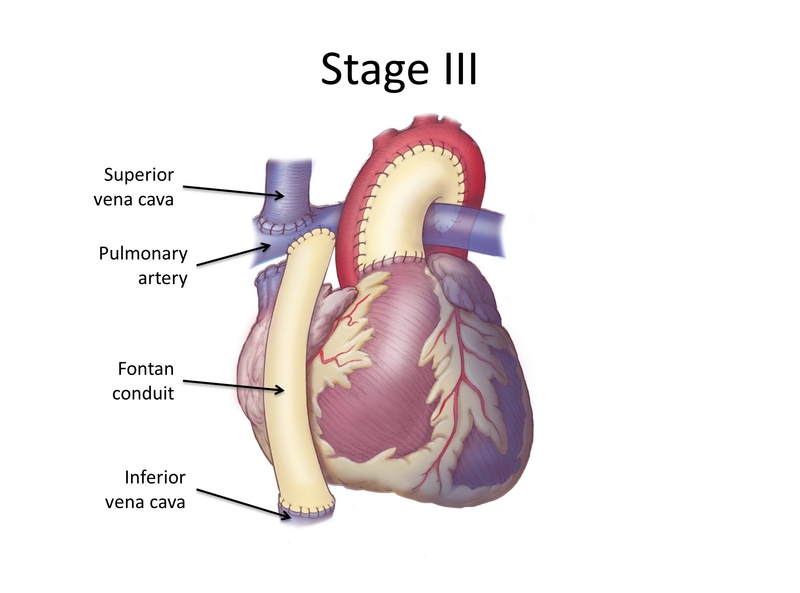 What is Hypoplastic left heart syndrome (HLHS)? 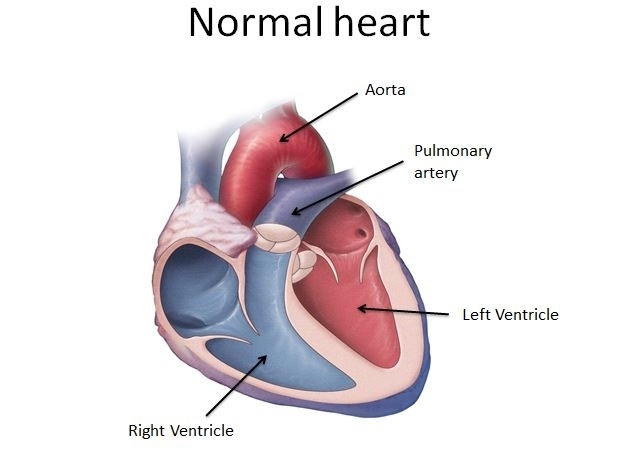 A. HLHS is a rare heart defect, affecting 1,000 newborns each year in the United States, in which the left side of the heart is severely underdeveloped, and the right side of the heart must pump blood to both the lungs and the body. The defect occurs during fetal growth and currently cannot be prevented. A. At this time, the cause of HLHS is unknown and there is nothing to prevent it. The birth defect occurs in utero while the baby is developing. There is a very slight increased risk (less than ten percent) that families who have one child born with HLHS will have another child born with a heart defect. Q. How is HLHS diagnosed? A. Doctors will use an echocardiogram, also known as an ultrasound, to diagnose the heart defect. HLHS is often diagnosed in utero using a fetal echocardiogram. Q. Will my baby need surgery? A. Doctors will determine the exact treatment for your baby depending on the severity of the heart condition and the family’s wishes. The only treatment for HLHS is aggressive, early surgical intervention. The most common approach involves a three-stage surgical procedure. The operations are performed within the first few years of life and create reliable blood flow in and out of the functional heart chambers. Q. What happens after surgery? A. After surgery, HLHS children need long-term surveillance of the reconstructed heart and often require heart medications. Regular appointments with a cardiologist will include echocardiograms, MRIs, blood tests, and heart catheterizations to ensure close monitoring of your child’s growing heart. Q. What are the long term impacts of HLHS? A. While science has made remarkable steps in treating patients with HLHS there is still no cure. Most patients will survive with treatments but may face other complications later in life. Some of these complications include heart arrhythmias, blood clots, developmental problems, and the possibility of future surgeries or a heart transplant. For more on this subject, please visit here. Q. Are there new scientific advances that will help my baby in the future? A. At the Mayo Clinic, we are making advancements to find new ways to treat HLHS through the use of four connected objectives: cell-based treatments, imaging and outcome, human genetics, and the creation of a biorepository. 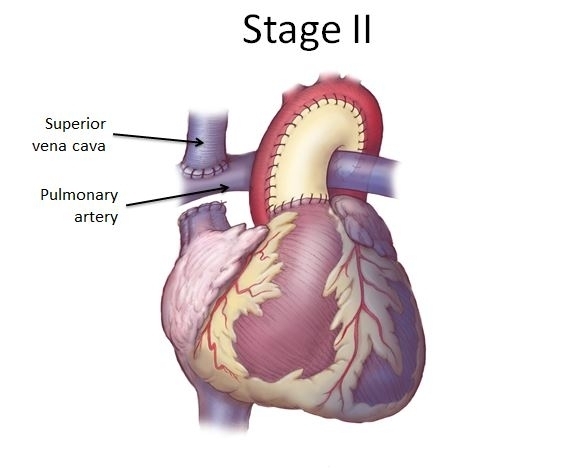 These advancements may delay and even prevent heart transplants for people with HLHS. Researchers believe stem cells can increase the strength of the heart, enabling it to pump blood through the body with greater power. By using cell-based therapies, team members are working to make the heart muscle stronger. This approach could possibly restore the right ventricle’s functional ability once it begins to decline or prevent the decline altogether. The Todd and Karen Wanek Family Program for HLHS currently offers clinical trials to individuals with HLHS. The goal of the trials is to determine how stem cells derived from different sources in the body, delivered at different times, can strengthen the heart of individuals with HLHS. In one clinical trial, umbilical cord stem cells are collected after birth and delivered directly into the heart muscle during the Glenn procedure. Another clinical trial uses stem cells collected from an individual's own bone marrow to be injected into the heart. Another use of stem cells includes comparing reprogrammed stem cells from children with HLHS and their unaffected parents to determine molecular differences in order to understand how HLHS develops. 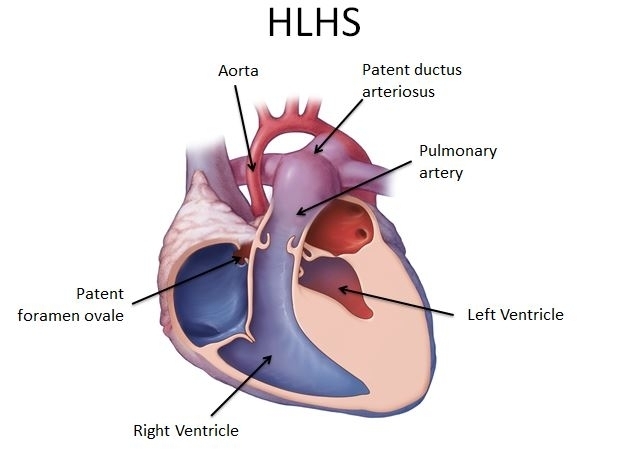 To better understand HLHS and the predictors of long-term right ventricular performance, researchers are comparing medical histories of HLHS patients by using ultrasounds and MRI images of their hearts. In addition, researchers are also improving the ability to assess right ventricular function noninvasively to detect declines in cardiac function as soon as possible so they can intervene in a timely manner. 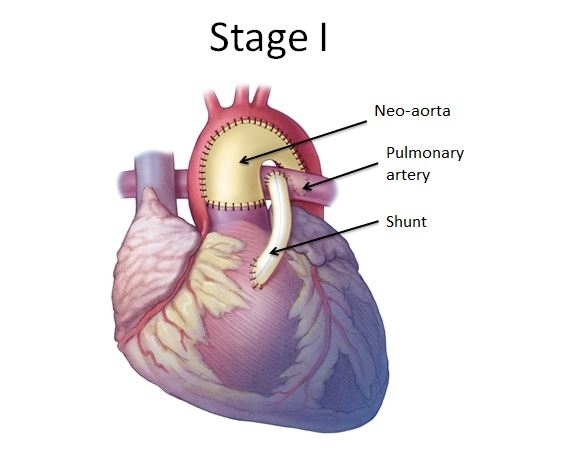 HLHS is likely caused by abnormal genes that result in the underdevelopment of the heart’s left ventricle. While those genes are currently unknown, researchers are analyzing whole-genome sequencing and bioinformatics to search for HLHS genetic variations. They are also attempting to detect changes in chromosomal material in people with HLHS. 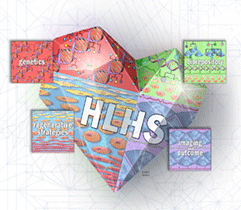 By working with families to collect family histories, tissue and cell samples, genomic information and heart images of HLHS patients and their relatives, researchers are studying HLHS and creating a biorepository. The biorepository includes clinical and genetic data, as well as tissue and other physical specimens used to further study HLHS and to explore new treatment options.